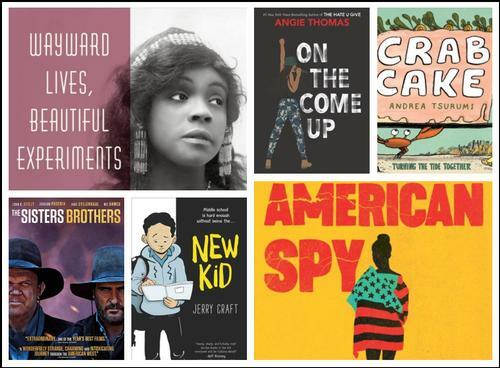 With February being Black History Month, may we suggest some new adult, teen, and children’s titles by African American authors, including the latest by Angie Thomas (the author of The Hate U Give)? Or how about an under-the-sea adventure story for young children or a comedy/western flick? You’ll find them all in our catalog and at a neighborhood library near you. Under the sea, fish do what fish do: Seahorse hides, Pufferfish puffs up, Parrotfish crunches coral, and Crab... bakes cakes? Scallop swims, Dolphin blows bubbles, and... Crab bakes cakes. And so life goes on, until one night when everything changes with a splash! In the face of total disaster, can Crab's small, brave act help the community come together and carry on? This new title by local author/illustrator Andrea Tsurumi is perfect for budding environmentalists, kids learning to cope with mishaps, and every young reader in between. Starting seventh grade isn't much fun for anyone, but try being one of the few students of color in an almost all white prep school in Manhattan. Jordan Banks is a talented young artist whose parents want the best for him, including the best education. This graphic novel sensitively explores themes of race, class, microaggressions, and self-identity. For fans of Raina Telgemeier and Gene Luen Yang. Sixteen-year-old Bri wants to be one of the greatest rappers of all time. Or at least make it out of her neighborhood one day. As the daughter of an underground rap legend who died before he hit big, Bri’s got big shoes to fill. But now that her mom has unexpectedly lost her job, food banks and shutoff notices are as much a part of Bri’s life as beats and rhymes. With bills piling up and homelessness staring her family down, Bri no longer just wants to make it—she has to make it. Angie Thomas’s homage to hip-hop, is the story of fighting for your dreams, even as the odds are stacked against you; of the struggle to become who you are and not who everyone expects you to be; and of the desperate realities of poor and working-class black families. It's 1986, the heart of the Cold War, and Marie Mitchell is an intelligence officer with the FBI. She's brilliant, but she's also a young black woman working in an old boys' club. Her career has stalled out, she's overlooked for every high-profile squad, and her days are filled with monotonous paperwork. So when she's given the opportunity to join a shadowy task force aimed at undermining Thomas Sankara, the charismatic revolutionary president of Burkina Faso whose Communist ideology has made him a target for American intervention, she says yes. Yes, even though she secretly admires the work Sankara is doing for his country. Yes, even though she is still grieving the mysterious death of her sister, whose example led Marie to this career path in the first place. Yes, even though a furious part of her suspects she's being offered the job because of her appearance and not her talent. In the year that follows, Marie will observe Sankara, seduce him, and ultimately have a hand in the coup that will bring him down. But doing so will change everything she believes about what it means to be a spy, a lover, a sister, and a good American. Inspired by true events, this novel knits together a gripping spy thriller, a heartbreaking family drama, and a passionate romance into a face of the Cold War you've never seen before. This series of stories examines the revolution of black intimate life that unfolded in Philadelphia and New York at the beginning of the 20th Century. Free love, common-law and transient marriages, serial partners, cohabitation outside of wedlock, queer relations, and single motherhood were among the sweeping changes that altered the character of everyday life and challenged traditional Victorian beliefs about courtship, love, and marriage. The book recreates the experience of young urban black women who desired an existence qualitatively different than the one that had been scripted for them--domestic service, second-class citizenship, and respectable poverty. Through a melding of history and literary imagination, this title recovers their radical aspirations and insurgent desires. Hermann Kermit Warm (Riz Ahmed), a gold prospector out in the 1850s Pacific Northwest, suddenly finds himself in a world of trouble. Notorious brothers are hired to kill him for stealing from their boss. Eli (John C. Reilly) and Charlie (Joaquin Phoenix) Sisters are brothers known all throughout the area for their wicked ways. The Sisters brothers pursue Hermann across 1000 miles of Oregon desert to San Francisco on a journey that will test the deadly family ties that bind in this genre-hybrid comedy/adventure/western. Just some of the new titles available at a neighborhood library near you in February! Add a Comment to New Titles Coming to the Free Library in February!